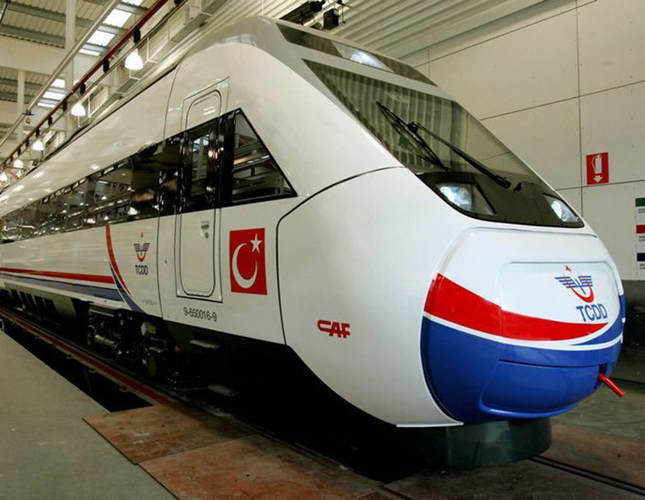 Economy Minister Nihat Zeybekci said yesterday that the Kars–Tbilisi–Baku railway line will begin operating this year during his visit to Azerbaijan. Visiting the Azerbaijani capital of Baku for a series of official talks, Economy Minister Nihat Zeybekci met his Azeri counterpart, Shahin Mustafayev at Baku Biznes Center. During a press conference held after the bilateral talks, Zeybekci said the two ministers addressed the development, growth and liberalization of trade between Turkey and Azerbaijan. The Kars–Tbilisi–Baku railway line will directly connect Turkey, Georgia and Azerbaijan. Construction work on the regional rail link project began in 2007 and is expected to be completed in 2015, although the project was originally due to be completed in 2010. The 826-kilometer railway will transport about one million passengers and some 6.5 million tons of freight in its initial stages. This capacity will later reach three million passengers and over 15 million tons of freight. Zeybekci also touched on the importance of the Trans Anatolian Gas Pipeline (TANAP) natural gas pipeline project, which Turkey is a partner in, and will provide energy supply security for the country. Turkish industrialists will procure 80 percent of pipes to be used in the TANAP project . "It is of great importance to make the Caspian Sea a sea of friendship and transportation," said Zeybekci. "Developing commercial and economic relations between Turkey, Azerbaijan and Georgia is as important as strengthening trade relations with Azerbaijan," said Zeybekci, adding that the finance ministers of the three countries will convene in Georgia on March 6 for this purpose. The finance ministers of Turkey, Iran and Azerbaijan will also come together at a later date. Referring to the current foreign trade volume of $5 billion between the two countries, Zeybekci said that this figure is not representative of the Turkish-Azerbaijani brotherhood, and should be increased to $15 billion soon. In order to achieve this figure, trade between the two countries should be liberalized, said Zeybekci, continuing, "We will start this liberalization with agricultural products. We are working on mutual liberal trade for Turkish and Azerbaijani agricultural products. Turkish and Azerbaijani technical teams have met three times to discuss the matter. We will lend impetus and want to obtain a concrete result in 2015. After achieving this, our primary objective is to liberalize trade in all fields between the two countries. We also aim to lift visa obligations for businessmen and other people." Touching upon brotherly relations between Turkey and Azerbaijan, Zeybekci said that a lot of work has been done thus far to improve relations, and it is necessary to take them to a higher level. "It is significant to pass down friendly relations to the next generation. We should establish a very strong partnership," he added. In reference to the accomplishments of Turkey in recent years, Zeybekci said Turkey's exports, which were around $2 billion in the 1980s, have reached $170 billion, and Turkish industry has opened out to the world over the past 30 years, competing with the world in the financial arena. Zeybekci said, "Azerbaijan and Turkey should sign a preferential trade or free trade agreements. Opening up to the world in a gradual way will strengthen Azerbaijan. We have mutual and successful investments in both countries and we need to increase these investments." Mustafayev expressed his satisfaction in welcoming the minister of a brother country, emphasizing that Turkish-Azeri relations set a model for the world. Mustafayev said that the economic relations between the two countries are at a very good level and they should be improved further. Zeybekci also held a closed-door meeting with Azerbaijani Deputy Prime Minister Abid Sharifov. He is also expected to meet Turkish businessmen as a part of his talks.